Easily add Highcharts, Highstock and Highmaps graphs to your Yii application. Create interactive charts easily for your web projects. Used by tens of thousands of developers and 59 out of the world's 100 largest companies, Highcharts is the simplest yet most flexible charting API on the market. Build interactive maps to display sales, election results or any other information linked to geography. Perfect for standalone use or in dashboards in combination with Highcharts! Note: Highcharts is free for non-commercial use only. For more information, please visit the Highcharts License and Pricing page. Note: You must provide a valid JSON string (double quotes) when using the second option. You can quickly validate your JSON string online using JSONLint. See /doc/examples for more usage examples. Highcharts by default displays a small credits label in the lower right corner of the chart. This can be removed using the following top-level option. Since version 3.0.2, all adapters, modules, themes, and supplementary chart types must be enabled through the top-level 'scripts' option. Previous versions relied on auto-detection magic, but that became less reliable as Highcharts evolved. The new method more accurately follows the native process of including/excluding additional script files and gives the user some finer-grain control. For a list of available scripts, see the contents of protected/extensions/highcharts/assets/. where my-chart-id is set via the top-level id configuration option. Just make sure you register your script after the widget declaration so that it has a chance to initialize. Upgraded Highcharts JS library to the latest release (5.0.2). See the Highcharts changelog for more information about what's new in this version. Upgraded Highcharts JS library to the latest release (5.0.0). Upgraded Highcharts JS library to the latest release (4.2.6). Upgraded Highcharts JS library to the latest release (4.2.5). Upgraded Highcharts JS library to the latest release (4.2.3). Upgraded Highcharts JS library to the latest release (4.2.2). Upgraded Highcharts JS library to the latest release (4.2.1). Upgraded Highcharts JS library to the latest release (4.1.10). Upgraded Highcharts JS library to the latest release (4.1.9). Upgraded Highcharts JS library to the latest release (4.1.8). Upgraded Highcharts JS library to the latest release (4.1.7). Resolved issue #12 by introducing new 'scriptPosition' option. Upgraded Highcharts JS library to the latest release (4.0.4). Added usage examples in /doc/examples. See the full changelog for earlier versions. Please use the 'Comments' section only for reviews. If you have questions, requests, bug reports or other feedback, use the links above. can it work with ajax? Hi, unfortunately i am not able to apply this with ajax call. can this work upon ajax call? aravaro, thanks for the error info. I have just released version 0.3 which is compatible with earlier versions of PHP. Happy coding! Could you please double check your recent 0.3 package? You seem to be missing "HighchartsWidget.php" All I see are the .js file. Thanks! Thank you, canreo, for pointing out the missing file. I re-uploaded the highcharts-v0.3.zip package with all files included. Cheers! By the way I was trying to populate data for series. But the chart only displays well Line2 and Line1 only gets (8,8,8) I am doing something wrong? How to display pie chart using highcharts? why highchartis giving different results with similar data structure? I am using high chart in my yii based application. now this the structure of data which can be passed to highcart for generating pie chart. but after passing this $catexp as data for pie chart I am getting wired output i.e. i am not getting the full chart and as the no. of entries increasing the chart becoming shorter and shorter. and passed this variable as data for pie chart and i got the full chart. So my question is what is wrong with my previous chart both the array structures are same but output is diff????? where $data is supposed to by an array of integers, typecast them to integers to make it work. Otherwise it will take the first integer and use it as the title and the second integer will be the value (the issue @rulight was having). Can it works with CActiveDataProvider? Can it works with CActiveDataProvider, just like CGridView?How can I pass a dataprovider to Highcharts's series?Thanks! 2.2.1 has been released. Changelog here. Can you please include the newer version? Several people seem to struggle with using data directly from a CActiveDataProvider. One suggestion has been to typecast to int. I needed floats, which I assumed my numbers were (must have been strings?!?). Either way, typecast to integer or float and the array from the data provider should work. Hope this would help someone trying for more customized chart dispaly. Has anyone had problems making the tooltips work? EDIT: Using Yii 1.1.10, you need to replace the highcharts.js and the highcharts.src.js files with the latest ones from the highcharts website and tooltips will be fixed. Is there any way to add a refresh button in ajax to refresh the chart? Today it's on Version 2.3.3 (2012-10-04) I must refresh plugin folder or wait for this extension upgrade ? @manuel-84, I suggest that you PM the author directly and send your files. Thanks for share it! How can retrieve color array from highchart? how can do it in widget ? 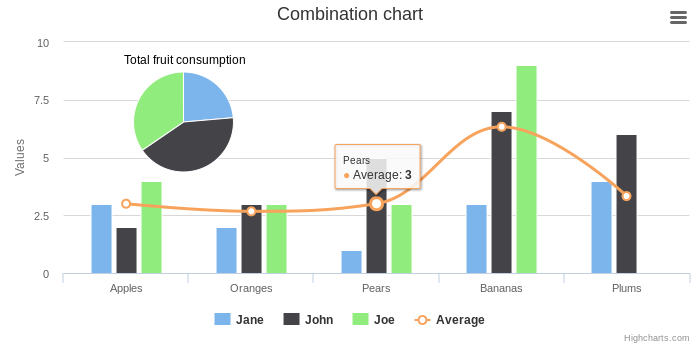 I have created my application in Yii framework version 1.1.9 and use highcharts for display data in graphical format. Its working awsome but today i have upgrade my framework version to 1.1.13. Now i can not get chart in latest version of framework. Is it possible to use the flags series type with this widget ? If so, could you please post an example of how to use it on a series ? i m looking for a way to export a chart to excel? When I remove this line, it works. How can i remove the print option? How can i remove the print option alone? I got the option for removing the entire export icons listed on top right corner, but how can i remove only one and use the other? Re: How can i remove the print option? You can find a solution here to work with individual buttons. How to adding link in bar/graph? Highcharts version 3 released, there are additional charts and modules included in the new release. Current extension auto include the highcharts-more.js by checking on the chart type options. There are some new chart types in version 3 not cater by the current extension, in order to support the new charts, modify to the extension is required. Meanwhile, Highcharts support multiple axes with different chart type by configure each of them in the series options, not in chart options. (Highcharts Demo - Multiple axes). This make the detection become much more difficult. Also, the extension cater to include only exporting.js module, not for any others. to overcome the problems mentioned above, i suggest to modify the code a little bit. * Publishes and registers the necessary script files. 1) Set 'gradient' to true? 2) Format legend like (browsers example): 'Chrome: 12.8%'? Thanks for the 3.0.2 update, Milo. Have you tried it using Yii 1.1.14 RC? I can't seem to get a simple pie chart to work, however, my bar charts work just fine. 1.1.13 works without problems. There is strange problem with 3.0.5 version, it simple doesn't show lines until browser's zoom is changed. I'd tried with the latest Chrome and Firefox even Yandex(Chrome), does anyone familar with this ? First congrats on this extension, it's really good, but i'm having a bit of a problem when i need to make a drilldown chart. All i need is a working example of a column chart with a simple drilldown, so i can figure out how drilldown is suposed to work, can anyone help me out please ? I had to register some scripts in order to run a drilldown on my localhost (not sure it's the same issue for you, let me know if there is another problem). Thanks patrice, but my problem isn't the script's, it really is the code..
What's the correct way to add a simple drilldown on the categorie Apples with this simple data : Red Apples => 2 and Green Apples => 3 ? @ptv1p3r, this is a model for a PHP-driven drilldown. Hope this helps. Thank you patrice, you are a life saver, i finnaly got the drilldown working :-) wow..
Just one remark for this extention, i had to download the newest highcharts lib, and extract the drilldown module from it to the extension modules, after that it all came together... thank you so much patrice for the help!!! Is it possible exports without internet connection? Thanks a lot for this extension. The snippet below is called 4 times in a view (this view being encapsulated in a page containing other Highcharts). However my code was working before and I can't find a way to instantiate the Highcharts widget in another way. This error occurs if you mix Highcharts and Highstock widgets on the same page. All functionality in HighchartsWidget is available in HighstockWidget, so the easiest fix is to use only HighstockWidget on the page. If you have further issues or comments, please post them in the dedicated forum thread, open a new issue or comment on the related issue I just created on GitHub. Super Ji Super. your extension saved my time a lot. Then add the following ABOVE the line. Does anyone have any better suggestions to do this? How can i add some life function for gauge charts. how i can use % in width ? I wish to create bar graph with count of records entered per month. I am able to get the months and the count. But from there i am stuck on how to get the data to display on the graph. Can anyone give me a working example of a solid gauge chart ? This null value was preventing the registerScriptFile of the highcharts.js script located in the generated assets folder making it unavailable to your view. Hi all, I need the chart is not generated as a interactive object but as a static image.